An interesting application designed to fight boredom at your desk... or anywhere else for that matter. Simply touch and drag the balls and then let go to set the cradle in motion. Tilt your iPhone left and right to play with the laws of physics. Enjoy! Its free: Get it here! We've hit #2 in Australia and #3 in America... Thanks to everyone that has downloaded it! We didn't expect this! We've hit 4th on the Australian App Store & 8th in the American App Store. Thanks guys! 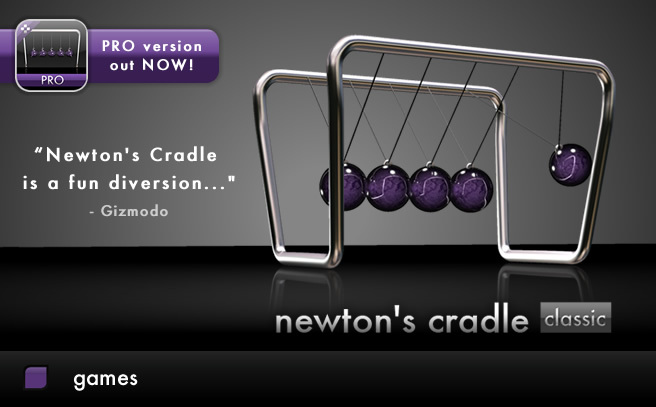 Newtons Cradle has been sent to the Apple Store for approval. Check back here for updates soon. Q: What do I do if the balls get stuck? Q: Why isnt the tilt function working?